To reduce the amount of trash and other undesirable material entering our waterways, Riverkeeper is working with the Gowanus Canal Conservancy, Newtown Creek Alliance, SWIM Coalition, and New York City Soil and Water Conservation District to stencil storm drains around Newtown Creek and the Gowanus Canal. 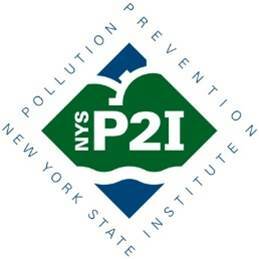 Funded by the New York State Pollution Prevention Institute, the project aims to both educate community members about their sewer systems and reduce the amount of street litter ending up in local waterways. Learn more about New York City’s combined and separate sewer system. Thus far, the Gowanus Canal Conservancy has kicked off the stenciling project with two projects, one with community volunteers, and one in partnership with the Brooklyn Urban Garden School (BUGS). Students at BUGS spent the year researching issues facing the Gowanus Canal and working with their advisory group to design and execute a project to combat their issue of choice. 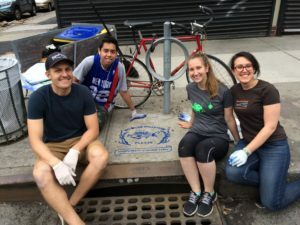 Students worked with Gowanus Canal Conservancy to design a stencil and paint the drains near their school, completing 16 stencils and speaking to passersby and business owners along the way. Opportunities to participate in projects with both the Newtown Creek Alliance and Gowanus Canal Conservancy will continue into the summer with events scheduled for July. The kit of supplies is available for rental from either organization, which comes with instructions so communities can do their own stenciling projects. 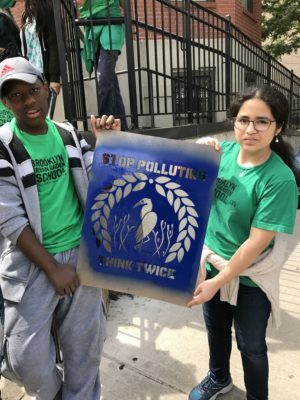 Both Newtown Creek Alliance and Gowanus Canal Conservancy will be hosting stenciling projects as part of City of Water Day on July 15 in Brooklyn and Long Island City. Learn more about the July 15 City of Water Day projects here. For more information about other Newtown Creek stenciling events, e-mail Lisa at lbloodgood@newtowncreekalliance.org or education@gowanuscanalconservancy.org for information about the Gowanus Canal stenciling events. Stencils were designed by local artists Jeff Dietz and Gabrielle Burger of Brieff Studios. Learn more about the stenciling project and how you can get involved here.